This is a day for visiting museums and the parts of Central Park missed last Sunday. This is the only day in New York we’re not going to purchase a 24 hours transport ticket as we’re going to be around hotel area. First step will be at American Museum of Natural History, from there, we will pass by Dakota Building, at the door of which John Lenon was murdered. Yoko Ono still lives in there. We will go into Central Park from that point to get Strawberry Fields (John Lenon memorial) and the rest of the main spots in Central Park we hadn’t visited yet, until reaching the other side, the East side, where Metropolitan Museum is. 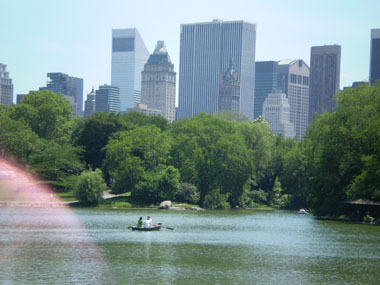 We will look after lunching in Central Park, in restaurant “Tavern on the green”. After visiting MET we would see the chances for a cruise over Hudson River. 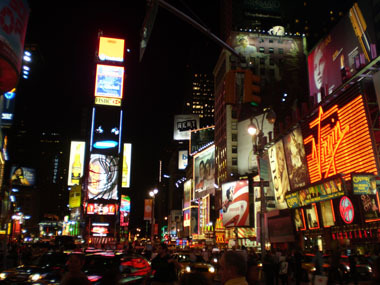 We could go to Times Square too for seeing the place by night. We will go to sleep early as next day we must take a flight very soon. All visits for this day are free. 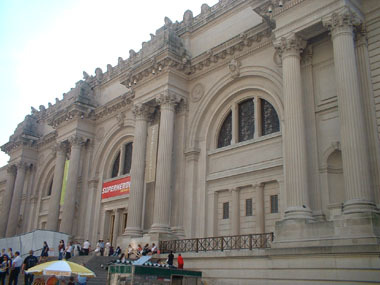 Both New York museums are free for entrance with a recommended fee to pay. We’re going out from the hotel a little bit earlier than usual; today is our last day in this city and what we cannot see today we won’t see it. We must follow the same way to our patisserie and metro station to reach the American Museum of Natural History, which is close to the station. In our way, we can see a graduation celebration on the street next to the hotel’s one. We get the Museum from behind, where we can see a small park and a big block of stone, like a short obelisk, making a monument with a plaque with Alfred Nobel’s portrait and the names of all persons from US have earned a Nobel Prize grabbed on the stone. It is a four-faced block, so still a lot of space for the future names. 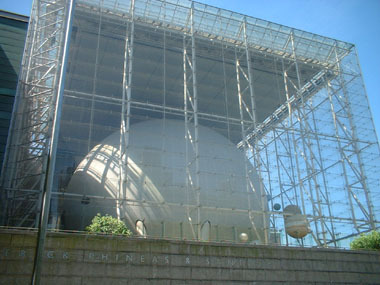 In our way to the main door we pass by the building’s side, which is transparent, with glass, letting the people see the planetarium inside representing a model of the solar system. The difference of size between the sun, as a big white sphere, with the planets it’s quite representative. 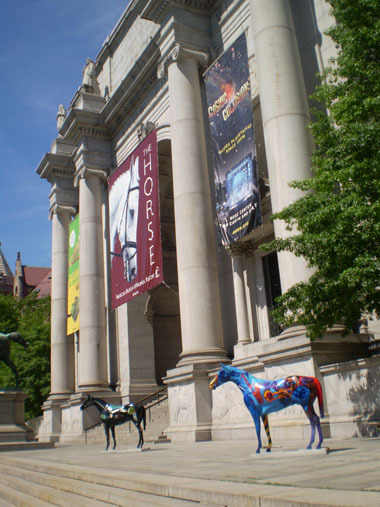 Once crossed the door, leaving behind the horse thematic facade because of an exhibition, and the statue of Roosevelt, which matches with that exhibition as he is riding a horse, we get in a big hall with the skeletons of a small dinosaur and a standing Diplodocus, with its long neck raising its head far in the higher ceiling. When passing by the desks we’re delivered a bill of 15$ per person and they point the display with the total in a clear sign of asking us to pay. 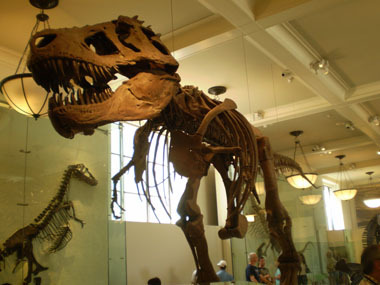 I thought the entrance to museum was free, but I use my credit card for accessing into the American Museum of Natural History a few minutes to 11h. The first hall is huge and it’s all about African mammals. A spectacular herd of elephants are in the middle and the walls around are full of windows to a natural representation of some animals in their habitat. 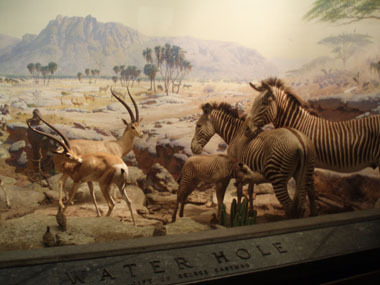 They’re called diorama and are all around the two floors of this hall and the rest of fauna ones. Some of the animals here are stuffed and some are clearly models made of some hard material but this is a fantastic environment where is not important what is real or what is not as everything is focused of being as didactic as possible. I knew about this kind of 3D representations because of “Friends” TV show, as Ross worked in here. You can see what a diorama is in this picture. There are more halls like this, as the Ocean live one, with a huge blue whale suspended from the ceiling and occupying the big space in the middle of this double floor hall. The entrance is located on a big room dedicated to the biodiversity and the best way of paying tribute to it is by an explosion of animals all over the walls and around, suspended from the ceiling on different highs following the evolution branches. There you can find yourself surrounded by fiches, reptiles, birds,… It’s spectacular! Not everything are animals on this museum as its theme is Natural Sciences and, therefore, you can find sections with models explaining, as schematic as possible, processes of meteorology, agriculture, evolution, geology, etc… Another big hall of this museum contains meteorites and minerals with the biggest meteorite in the world. There are some more halls with objects and clothes from other cultures, as pre-Columbian or Asian ones . Somehow, as the main hall at entrance pointed already, the greatest attraction is on the second floor, which is exclusively dedicated to Prehistory. I was already a dinosaur fan long time before Jurassic Park fever and I knew a lot of these creatures and admired the fights between a Tyrannosaurus Rex and a Triceratops as a paradigm of the fight between carnivores and herbivores because of reasons self-explained on their category names. I never heard about a Velociraptor before Spielberg’s movies, though. So I can enjoy with what I was fascinated to when I was a child and reckoning some of the things I have in front of me, as the fossil of a whole Archaeopterix I saw so many times on books. There is a great collection in here, with all the skeletons build, real size – obviously if they’re real fossils – and the itinerary through them ends with the Mammoths and Dinostore where, with coherence with I’ve already explained, I should bring something to home: a real fossil of a shark teeth by 6$, it comes with a certification saying it is real!. The certification has something to do here as the price and the fact that there are a lot of these fossils in a bucket where people can handle at their will can make someone to doubt. Doubts which my wife doesn’t have at all, she is sure “that” is not 50 million years old as the certification states. 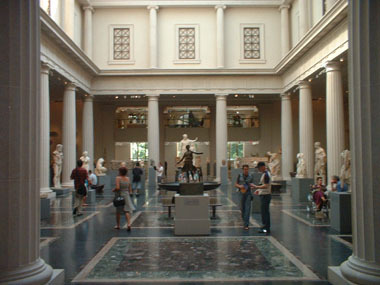 When leaving the museum I take a look at the ticket desks. It seems the 15$ of admission is a recommended price. I’m thinking may be the entrance is still free, it’s just they try it doesn’t seem so. Our plan would be to get into Central Park, which is just in front of the museum, but we walk back to the hotel instead as Eva needs to change her shoes and visiting the toilet. 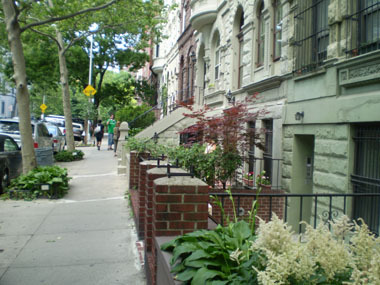 This short walk becomes a tour by our neighborhood: the Upper West, with the typical houses with stairs to the door. The picture at right is a very peculiar warning, at least for me. 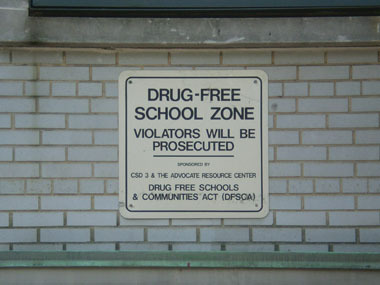 It’s clear they want to point drugs cannot be sold here but the special point is, can they be sold anywhere else?. Maybe I’m being a fusspot here, but I think signs preventing people of doing something is illegal everywhere loses its point. That’s what I’m meaning. 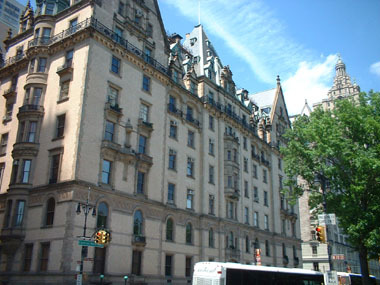 From hotel we go directly to Dakota Building. It is a nice and well cared building with characteristic triangular endings at its top and a golden lodge with a doorman in every door. In front of one of those John Lenon was killed and one tries to imagine. 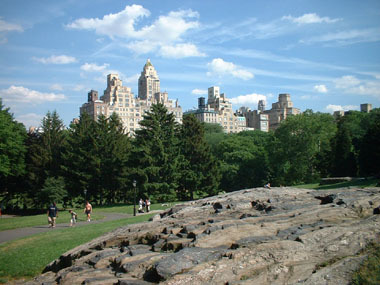 Just in front of this building there is an entrance to Central Park and we use it to dramatically change of environment. A maze of paths gives access to numerous wild nature spots. There are some stone or wood bridges covered by vegetation. Although the main tracks are asphalted in order can be used by bicycles, bikes, horses, buggies, skaters, runners, etc… if you take some way apart from them you’ll feel lonely in the lush, even the city noises disappear! Somehow, the city of skyscrapers is still outside and you can see it over the top of the trees when there is an open space in a beautiful landscape because of the contrast. We reach a lake with some rowing boats but we’re looking for Strawberry Fields, which is the John Lenon memorial, with a mosaic in the ground with the word “Imagine” in the middle. There are some boxes around where you can get information about the park. All of them have maps of the park with the main spots marked on it. It helps us to get to the place, which uses to be full of flowers, but not today, as it is in improvements. 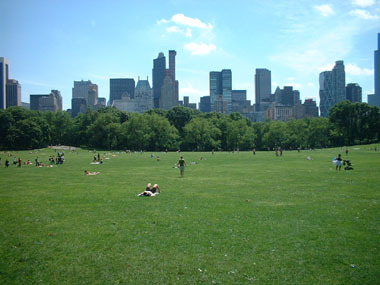 I have planned to lunch on the “Tavern on the green” because I could see it on TV and I looked for it as well on the map, so I know the way to it, after some place called “Sheep Meadow”, which is actually a meadow, but very beautiful with that bottom of trees and buildings. There are a lot of people here lying on the grass and it must be the best place in the city for a picnic . Tavern on the green is beautiful with its motley decoration of mirrors and multicoloured glass compositions. It looks luxury and snooty. May be too much for us wearing shorts and T shirt in contrast with how the other guests are dressed here, as a cockle in a bakery. So, once in our table with our big glasses of water already served I opened the menu for checking the prices. The first I see are the ones for drinks and immediately we agree on taking advantage of the free water this time. Then, a single dish per person would do the work and order the ones closer to 20$, which is basically the minimum. Pasta for me again, but I’m happy with it. Thanks to our savings bill don’t reach 100$ at the end although we are not that full as the other times. I must tell, though, the basket with the assorted of bread was completely empty when we leave the table. They were delicious! 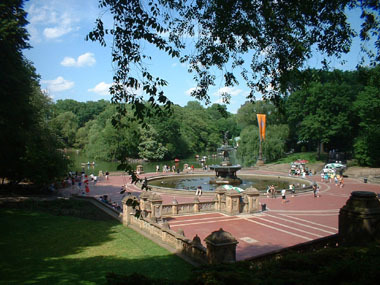 Once again in the green of Central Park we go to the fountain and we can see some people ending with their filming work, but we couldn’t see what was al about for some minutes, then, we can see downstairs the known landscape of the fountain with the lake, as we could see it in multiple movies before. The last one: “Enchanted”. We’re in the middle of the park now; our way will be always to East from here to reach the Met. The walk is nice, but longer than I expected. We reach the East end of the park soon but, as we can see on our map, the museum is more at North. Then we walk across beautiful landscapes until reaching it, but there is no exit here, so we walk behind the long building until we can go out to the street and get its entrance. Now we’re tired. The area before the entrance to the Met is full of street painters offering their services for portraits or caricatures but we go directly to the door as we know they close at 17:30h, so we only have one hour to spend in the museum. 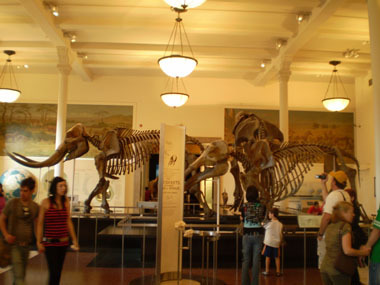 We must pass by the ticket desk where they try to make us pay 20$ per person but, as I’ve got the experience on the Natural History museum this morning, I ask “Isn’t it a free-will admission?”, and they answer “Yes, but this is the recommended price”. “But I can pay a different amount, can’t I?” I insist, “Yes, but there is a recommended price to help to museum conservation”. Their “Yes” make me be more confident and then I state “But it’s going to close in one hour, we shouldn’t pay the same than the people who spend the whole day inside” and the I get what I was looking for: “ok, it’s true, how much do you want to pay?”. 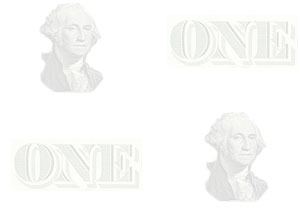 With my victory I want to be gentle and I pay 20$ for all three of us, like a 3x1. So, that’s how the free-will system works: you must be over some shame and pressure to get your real free-will price. The entrance ticket of this museum is quite original: a blue circled badge with the logo to put on a buttonhole . As we cannot waste any time we set priorities to the museum areas. 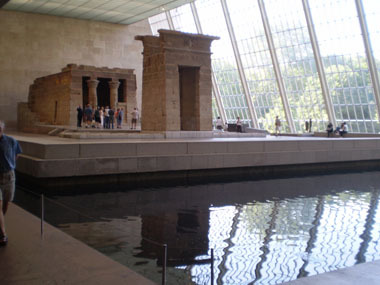 The first place is for the Egyptian one, with the temple of Dendur in it. It’s the one in the picture above at right. There are a lot of more things in there, though, as sarcophagus, mummies, gods' statues and a good collection of papyrus. 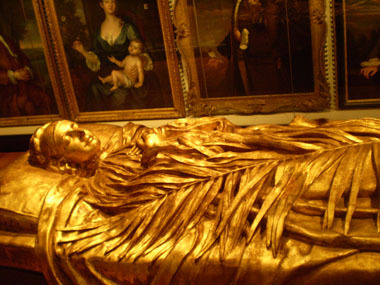 We go across American art just as shortcut to the wings with Roman and Greek art, as the assigned priority is low, but I was wrong here as we get astonished with some pieces, as the tomb effigy of Elizabeth Duveneck, a sculpture from his husband, Franck Duveneck, which I’ll never forget. It’s the one at left. Time is running and there is a Chinese temple in the second floor I want to see. We walk quite fast across Assyrian, Islamic and Korean art halls until reaching the Chinese one. When we’re going to enter into the temple the guard tells us it is closed. Since we can see people going out from it we can deduce it has been closed just now, so I beg for one minute and I get the desired answer: “Ok, one minute. But just one minute!”. It is time enough because it is actually a small temple with a courtyard with garden and facades with the typical Chinese roofs. We then leave that area thanking the guard with a smile and watching the pieces in our way to the exit. For an unknown reason we came with a prejudice about the character of US people and we’ve been surprised by the kindness and friendliness we’ve received anywhere and any moment. We take a taxi to hotel but we’re not going to end the journey here at this is the last day, so we go out, once dark and rested, for dinner but, before, we’re going to walk around Empire State Building area . After one single metro ticket of 2$ each of us can be in front of the famous skyscraper. There are lights along all of it, until far in the sky, where the top looks colourful. The Chrysler Building is in lights too. We walk a couple of blocks to West shopping on some souvenir stores in the way. I ask for the price of a free iPhone I could see at window: 500$. And it is the old version! I must definitively forget about bring me one to home. We reach the Madison Square Garden. We can see a big square building with a big canopy at its entrance, with a big screen and a big basketball ball over it. How big is everything! Although may be cannot be seen well at picture. As all is that big we almost leave missing the stadium facade behind. We’re leaving and I’m checking my map for our options to go to Flatiron Building. It’s now or never. Ok, it’s never. 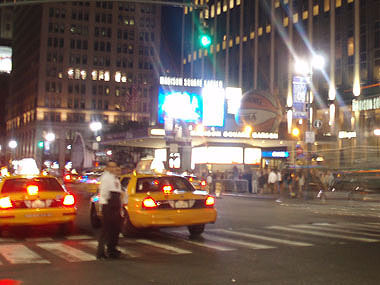 We decide coming back to the hotel area and dinner somewhere nearby but we stop at Times Square in the way. We want to repeat this place as it must look spectacular by night with all the lights. And it really is. There are even more people than the morning we were here two days ago. It is crowded as per being a lot of people on the road too. It’s kind of tiring, so we return to the quietness of what is no longer going to be our neighbourhood here. We leave the shopping bags at our room and leave for some dinner. We want soup tonight. We’re checking the menus of all the restaurants looking for it. When I say restaurants here, I’m meaning those typical places with a long bar with stools and tables in front. We find a valid one soon for a very cheap dinner. Then we walk around and go into a bar for taking some beers. And then some more, since we finally end coming back to hotel at 2 AM. The party appeared just the eve of an early flight in the morning .